About this time each year I re-read “A Christmas Carol,” by Charles Dickens. By far, the saddest portion of the book is the scene where the ghost of Christmas past forces Ebenezer to relive the day his fiancée breaks their engagement and his heart. While we often assume that Ebenezer did not love Belle, the sad truth is that Belle never really loved Scrooge. Belle’s financial personality is what Bert Whitehead, financial expert and author, describes as a “Bon Vivant” in his book “Facing Financial Dysfunction.” In his book, Whitehead maps financial personality on two different axes. The first axis measures people’s tendency toward greed or fear. Belle, like all Bon Vivants, tends to be more fearful, while Ebenezer tends to be more greedy. The second axis measures an individual’s tendency to save or spend. Ebenezer tends more toward saving. And although Bon Vivants are more balanced in this respect, the balance they achieve is not necessarily a healthy thing. Bon Vivants are not spendthrifts or shopaholics, but nor are they misers. They don’t spend money on everything; they only spend money on themselves. Feeling insecure and somewhat fearful, Bon Vivants keep their spending personal. When we first meet Belle, she is described as a fair young girl in a mourning-dress. Mourning-dresses were worn only by the most fashionable of young ladies. Mourning was an expensive activity. It was as wasteful as it was fashionable. Therefore, it provided a perfect litmus test for the rising middle class to show how in sync they were with royal attitudes. Belle, like most Bon Vivants, finds it easy to spend money on herself. Mourning etiquette filled the women’s magazines of the day and women competed to show their ostentatious devotion. Normally, it lasted two and a half years. During the first year and a day, they wore full mourning dress with coverings of black crape. Accessories such as mourning veils, brooches, buttons, beads, fans bonnets and handkerchiefs helped to complete the fashion statement. During secondary mourning, the pieces of crape were gradually removed and replaced with lighter ribbons until in half mourning non-black clothes of subdued shades could be worn. Bon Vivants often have closets full of clothes, many of which have often never been worn. They are sharp dressers and reward themselves by shopping. In addition to fashion, Bon Vivants love to own the latest technological devices. They love to shop online and will purchase anything that saves them time and effort. When status is involved, they buy only the top-of-the-line brand names. Bon Vivants are also driven and successful workaholics. They work long hours and usually make a lot of money. Even in estate planning they are likely to leave sizable donations to foundations and projects bearing their name. Bon Vivants are some of the few people who, at the end of their lives, actually wish they could have spent more time at the office. Their spending is at least partly a reward for their hard work. Belle tells Ebenezer she expected that they could “improve our worldly fortune by our patient industry.” She breaks her engagement with Ebenezer because although she has been patient, her worldly fortune has not improved. She says she is “fraught with misery” and dwells on these thoughts often. Her great fear is that her love does not have enough worth of value in Ebenezer’s sight. She wants him to continually seek her out and win her. And, she makes the mistake of judging his love for her on a monetary basis. Belle accuses Ebenezer of loving money more than he loves her. The truth is that she loves money to be spent on her more than she loves Ebenezer. This preoccupation with money leads many Bon Vivants to keep emergency cash stashed around the house in places known only to themselves, such as a secret cookie jar or a personal sock drawer. Investments don’t make them feel secure. Wealth has to be close at hand and personally accessible in order to satisfy their insecurities and alleviate their fears. Ironically, Belle accuses Ebenezer of fearing the world too much because he risks, earns, and saves. But, it is actually she who has the greater fear and insecurity. She feels she has been slighted, and a Bon Vivant cannot stand being slighted. Belle isn’t mad while she is breaking her engagement with Ebenezer, but she couldn’t be more cruel. She places all the blame on Ebenezer’s lack of love for her, though the only acceptable proof of his affection would be a very expensive token of his esteem. She makes the mistake of measuring how people value her by what they spend on her. She is so out of touch with Ebenezer that she claims any pain she is causing him will be very, very brief, and he will dismiss it gladly in a short time. She couldn’t be more wrong. Even after many years, it still tortures Ebenezer. It is easily argued that the pain caused by Belle calling off their engagement is the root of Ebenezer’s personality faults. Her rejection of him leaves him shattered and triggers his withdrawal from society. Had Scrooge married Belle, his diligent work would have been praised as faithful provision instead of as cold hearted greed. As the story continues, the man Belle ultimately marries fits better Belle’s view of money. We see Belle’s husband in the next vision when he arrives home from work. He knows better than to arrive empty handed and is laden with Christmas toys and presents. He is greeted by his large family with such an onslaught that they scale him with chairs, pick his pockets, and carry away his brown-paper parcels. The multitudes of children grab his cravat, hang on his neck, pommel his back, and kick his legs – all to tear into his packages. Belle has clearly set the financial tone of the family. 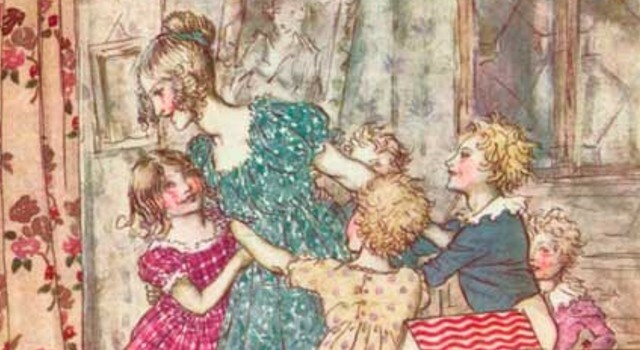 If the story were re-told, Belle’s Christmas ghost would have shown her the starving children of Vanity and Egotism. She needs to learn to measure wealth by what is saved and invested, not what is spent on her. But more importantly, she needs to learn that true love is more concerned about working together to reach your financial goals than about selfishness, anger, hurt, and resentment. I feel sorry for Ebenezer, but in the end, Belle didn’t deserve him. My regret is that Scrooge never found someone like Mrs. Fezziwig who would have loved him enough to draw him out and remind him of the real purpose of his wealth. The tendency toward measuring our status and prestige by what is spent on us isn’t limited to Victorian England. It is the defining yardstick of our times. Don’t be like Belle. Don’t let your financial attitudes devastate the lives of family members who love you.